If you went to the polls today, you probably spotted a few voters snapping photos on their cell phones. We wanted to get a voters-eye view of the voting experience, so we created an experimental website. 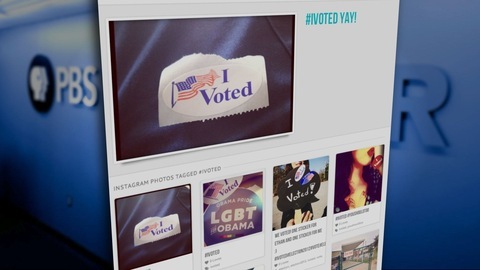 LookIVoted.com scoops up images on the popular Instagram social media network and displays them as a stream. Visitors can take a look at all of the images as they stream in, or click on tags to filter their results. Take a look at photos created by voters who vote for Mitt Romney, or only those who voted for Barack Obama. What do you think of NewsHour’s experiment? Please leave your thoughts below in the comments. A disclaimer: The photos flowing into lookivoted.com are not moderated, so from time to time, visitors may see objectionable content. Travis Daub is Digital Director at PBS NewsHour where he manages the incredible digital content team and oversees the integration of online and on-air content. With 20 years of experience in online publishing, Travis has been honored to work alongside talented colleagues at the PBS NewsHour, Foreign Policy magazine and the Des Moines Register.